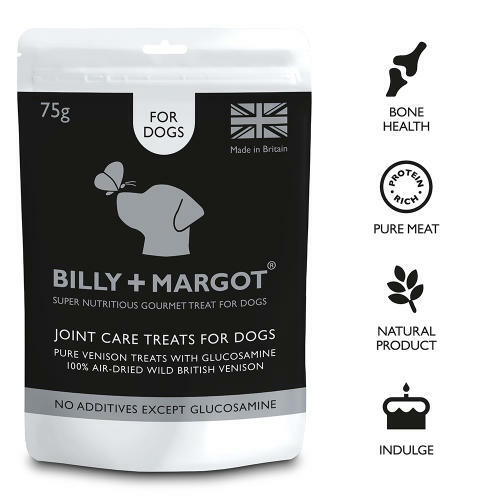 Billy & Margot Joint Care Treats are air-dried treats made from 100% pure venison meat in edible sausage casing. These treats contain Glucosamine and are perfect for older dogs or breed that are prone to joint problems as well as being suitable for dogs with food intolerances. Glucosamine is utilised in the body's synthesis of the lubricants and shock absorbing mechanisms that are required to maintain and restore healthy joint performance. It also enhances the body's ability to manufacture collagen and proteoglycans, which are essential for rebuilding joints and supporting synovial fluid which lubricates the joints. Composition: venison meat, glucosamine, collagen casing. Analysis: Crude protein 54%, Fats and oils 25%, Crude fibre 12%, Crude ash 6%Each treat contains approximately 100mg Glucosamine Sulphate.